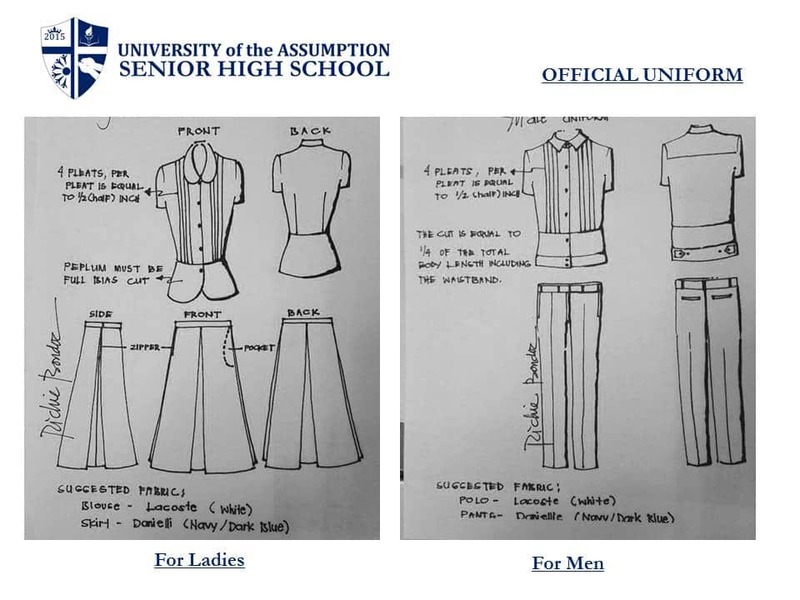 The University of the Assumption Senior High School (UASHS) is envisioned to form students to become academically competent, morally upright and socially responsible individuals who are equipped with 21 st century skills. UASHS strengthens the knowledge and expertise of the students to prepare them for higher education in the four (4) strands under the Academic Track. General Academic Strand (GAS) prepares the student to any program in college. Humanities, Education and Social Science(HuMSS) Strand introduces the students to basic subjects in humanities, education and social sciences. Science, Technology, Engineering and Mathematics (STEM) Strand prepares the students to courses in science, technology, engineering, and mathematics. Accountancy, Business and Management (ABM) Strand prepares the students to business courses in college. Applicants must be in Grade 10 from any DepEd accredited public and private schoolsat the time of application. Applicants for ABM, HUMSS and GASstrands must have a general average grade of 80 in Grade 9 with no failing grades and have good deportment records. Applicants for STEM strand must have ageneral average grade of 85 and above. Final grades in Math and Science must not be lower than 85 and have good deportment records. One (1) piece of recent 2 x 2 close up photo. Recommendation Form signed by the principal or guidance counselor of the junior high school of the applicant. Secure an Application Form from the UA Guidance and Admissions Office or the UAJHS Guidance Office or download here. Submit the duly accomplished Application Form, together with the admission requirements, to the UA Guidance and Admissions Office. The names of students who qualified to their preferred strand will be posted on the bulletin boards of the UAJHS Guidance Office and published on www.ua.edu.ph on November 5, 2018. If qualified for admission, pay the non-refundable, non-transferrable Reservation Fee of P1,000 at the Finance Office on the 2nd floor of Ryan Building. Please keep your Official Receipt for the reservation fee since you will need this during the enrollment. The reservation fee is not a guarantee that the applicant is enrolled. The applicant must still enrol during the scheduled enrolment dates for their strand and grade level. Failure to do so, may result in the cancellation of the slot. Encoding of Student’s Data at the Computer Laboratory upon payment of the reservation. Qualifiers who wish to avail of scholarshipor grant may apply at the Office of the Student Affairs on the 2nd floor of Aniceto Building. Secure an Application Form from the UA Guidance and Admissions Office or the UAJHS Guidance Office or downloadhere. Pay the testing fee of P300 at the Finance Office on the 2nd floor of Ryan Building. Secure UASHS Entrance Test Permit from the UASHS Guidance and Admissions Office. Applicants with incomplete requirements will not be allowed to take the test. Take the UASHS Entrance Test as scheduled. Examinees are required to come on time and to bring their own pencil and eraser. If qualified for admission, pay the non-refundable, non-transferrable reservation fee of P1,000 at the Finance Office on the 2nd floor of Ryan building.Please keep your Official Receipt for the reservation fee since you will need this during the enrollment. The reservation fee is not a guarantee that the applicant is enrolled. The applicant must still enrol during the scheduled enrolment dates for their strand and grade level. Failure to do so, may result in the cancellation of the slot. Issuance of UASHS Enrolment Kit. Scholars who are entitled to the DepEd voucher will receive an allowance at the end of the school year equivalent to the difference between the value of the voucher and the balance due after deducting the discount. This ASF Grant is granted to academically qualified but financially hard-up students. It is equivalent to 100% or 50% of the tuition and miscellaneous fee after deducting the DepEd voucher, depending on the qualification of the grantee.